It's RSNA time again, which means lots of walking, talking, and of course—the RT staff's favorite—deep-dish pizza. It's always a whirlwind week, so, as a service to our readers, we're once again publishing a navigation guide to help make sense of the chaos that is McCormick Place this time of year. I'm curious to see what this year's hot topics will be, but a quick glance at the educational program offers a few hints. Not surprisingly, artificial intelligence technology figures to be prominent, but the early favorite for the most discussed issue seems to be radiology's changing role in health care. From making radiology more patient centric to finding new ways to demonstrate value, it's clear that radiology is undergoing a significant transformation. For the first of our two RSNA issues, we're presenting some topics that have been getting a lot of attention this year. 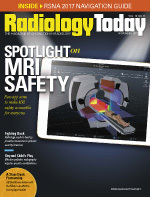 Our cover story details a new app that Emanuel Kanal, MD, from the University of Pittsburgh has developed for MRI safety. It's a completely revamped version of his original app, and, judging by the stories of MRI mishaps that I've heard this year, it's a timely addition to the body of MRI safety knowledge. Another hot topic has been cybersecurity. Aside from revealing confidential patient information, compromised medical imaging systems could pose a threat to patient health. On page 18, Beth W. Orenstein talks to some of the experts to find out what radiology can do better to avoid being victimized by hackers. Also, Keith Loria writes about a partnership between the National Basketball Association and GE that may one day keep your favorite players on the court longer or, perhaps, help you or your kids recover faster from pick-up game injuries. Finally, Jeannette Sabatini reports on the challenges associated with pediatric imaging; there's definitely more to consider than simply reducing radiation dose. If you happen to be at RSNA, stop by booth 3253 and say hi. Enjoy the issue and the show.